To give you must receive. 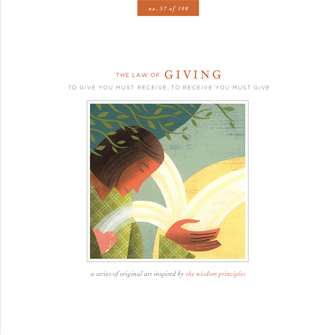 To receive you must give. Breathe in the abundance all around you. Now breathe out, gifting your abundance to the world. This is the rhythm of life, its vital circulation. Giving and receiving originate in each other and thrive in balance. Together they form a great circle. One of these cannot exist for long without the other. Giving that is not continually sourced in receiving exhausts itself. And receiving that does not flow again into the world stagnates. Both must be in motion.